When your local paper features a story on a new model home with a two story master closet, you go. Thus my lazy Saturday style adventure began. After you choose and purchase your new home, there seems little reason to continue looking at model homes. But this is actually the most beneficial time to go to model homes. As I mentioned in my previous post Model Home Mirages, model homes set a pretty unrealistic expectation of what your home is going to look like. They have all the bells and whistles and are decorated so fine, that you feel like you’re in a Better Homes and Gardens magazine. And that is EXACTLY how you should see it. Now that I’ve already chosen my home, I am using this opportunity to walk through model homes only focusing on the amazing interior design. Instead of buying magazines for $10 a pop, I can simply drive to a few local model homes and experience the designs first hand; walk through the living exhibit, touch it, live it, and figure out what I want in my own home. Therefore price doesn’t matter and of course I chose to walk through a $2.4 million dollar, 5000 sq ft monstrosity. Part of the perfect home is the perfect hostess. Like many women finding their balance between career and domesticity, I have unrealistic dreams about throwing glamorous parties with beautiful centerpieces, calligraphy name cards, and photogenic dishes. I figure with these ambitions, I should start honing my baking skills. The ultimate goal of course it to bake something so beautiful that there is a collective “Oooh” across the dining room and everyone can’t help themselves but get their phones out and take a photo. In this post – a terribly photogenic but downright inedible lemon ricotta cake, the moistest chocolate cupcakes in the world with delicate matcha green tea buttercream, and some pretty decent yet unimpressive lemon bars. No you didn’t misread. I did something stupid which is that I took a random recipe off of pinterest without doing any research on the blogger nor did I read any reviews on the recipe. Now the photos are gorgeous, just as they were the first time I saw it on pinterest. But I might as well have been eating sawdust. Now, to be fair, I made a very cavalier substitution of coconut flour for almond flour because I didn’t have enough almond flour left in the house – oops. Anyway, here are the beautiful photos but BEWARE DO NOT MAKE. Countertops are perhaps one of the most important things to me and my kitchen. Our house features a huge 60 sq ft island in the middle of the open plan kitchen and therefore it will be the centerpiece of our primary living space. My first visit to the design center produced mixed results in terms of countertops. The only option that they had that I was in any way happy with was carrara marble. But all I was given was a little 6”x8” swatch that really tells you nothing about a slab of natural stone. Leaving the design center with little confidence on the countertop options, I knew I would have to take things into my own hands. After some internet searching I found a countertop fabricator in the Houston area that had a showroom and also happened to carry Blanco sinks. So I was able to accomplish two things at once. American Countertop Fabricators were extremely helpful and taught us a lot about what really goes into a kitchen countertop. One thing we learned, most edges, bullnose, beveled, waterfall, were free. This was something that our builder plans to charge us for. Haha, not anymore! I have discovered that the internet is the worst place for Appliance reviews. 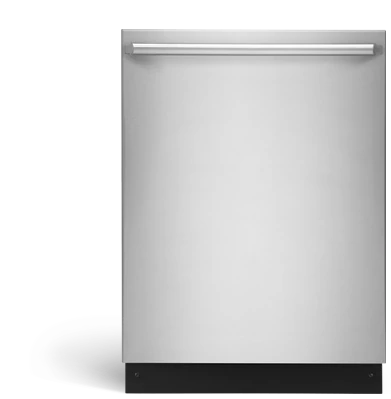 Did you know that according to the internet, every dishwasher is “without hesitation, the worst dishwasher you will ever buy”? There are no good ones. None whatsoever. And if anyone ever tells you it’s a good one, they are being paid off by the manufacturer. It’s completely ridiculous. I chose this dishwasher over the Frigidaire (FPID2497RF) for a few reasons. First, because of the third rack. I am in love with the idea of a third rack because where do you put all of the wooden spoons, spatulas, etc? Usually they end up crowding my glass space on the top row, but with a third rack, this becomes a problem of the past. Second, true stainless steel. Frigidaire has a “feature” called smudge-proof stainless steel. The problem is that this is not the same color as actual stainless steel. So unless you plan on your entire kitchen being Frigidaire, your appliances won’t match. If you’re the type of person that reads that last sentence and thinks I’m crazy, then maybe you won’t care. Even as I write it, I find myself sounding a little crazy, but what I can I say. I’m a little obsessive about my future kitchen. Now, according to the actual review on Reviewed.com, this dishwasher won dishwasher of the year in 2014. According to the comments on reviewed.com, this dishwasher is the worst on the planet. But then again, according to all comments online, every dishwasher is the worst on the planet. So just like every other first time appliance buyer out there, I am completely confused so I’m going to make a blind guess. Thanks a lot internet. 1.) 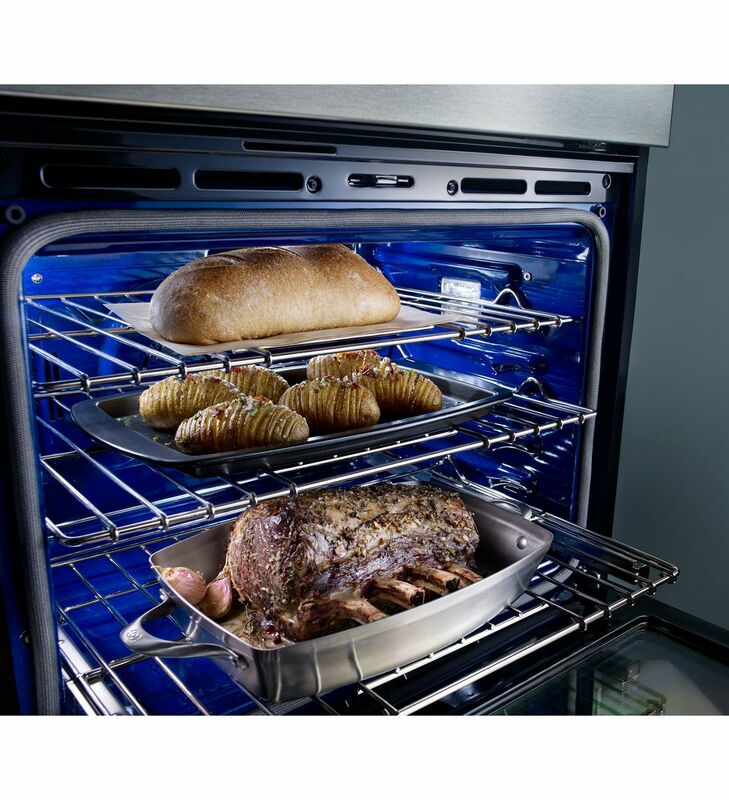 Easy glide oven racks. So with very little effort, you can glide the racks in and out. 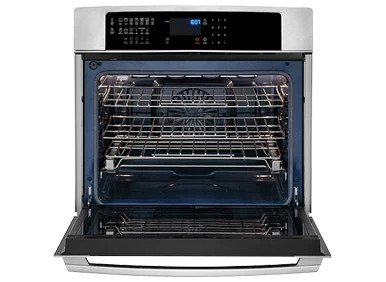 Sounds like a small thing, but with double ovens, the top oven is usually at a pretty awkward angle when you are trying to put things in or out. Or when you are trying to put a tester toothpick in a cake. If you bake a lot, this is a must have feature in my opinion. 2.) Blue interior. Yes this is irrational. I am aware of this. But the way I explain this irrational desire is that what I really wanted was the KitchenAid True Convection Double Oven (KODE507ESS) and it is also blue inside. These two ovens actually have a lot of similarities in features so I guess I’m trying to fool myself into thinking that I got my first choice. 3.) Built in Temperature Probe. I’ve never used a meat thermometer before. I usually just follow the recipe and hope that whatever I am making doesn’t come out undercooked. Usually a fine approach for beef, possibly disastrous for poultry. So the built in temperature probe in the electrolux is my new must-have that I have never actually had. Let me start by how I decided on what kind of Cooktop I wanted. I grew up using Gas. I suffered through Electric in college and in multiple apartments. I am ready to go back to Gas. For me, it is easier to control, easier to use, and much prettier. Also if you trust the judgement of chefs around the world, gas is the way to go. I also new that I wanted 36” or bigger. 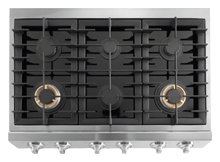 I recently had a glimpse of a 27” cooktop in a brand new kitchen and it looked like a toy. Aside from the aesthetics, I also cook a lot. I cook multiple things on the stove at the same time. So more space is better for me. The last requirement was professional style knobs on the front. Again, this is superficial, it was more about my vision for my kitchen. Those requirements led me to this particular cooktop which is the only one that electrolux/frigidaire has with those key features. This is not a review of these appliances, as I have not bought them yet. This is a pre-view. You could read this and say “no! no! don’t choose those!”, but it’s too late. You are on the internet and I wouldn’t believe what you say anyway. It is decided. Does anybody remember Expo? 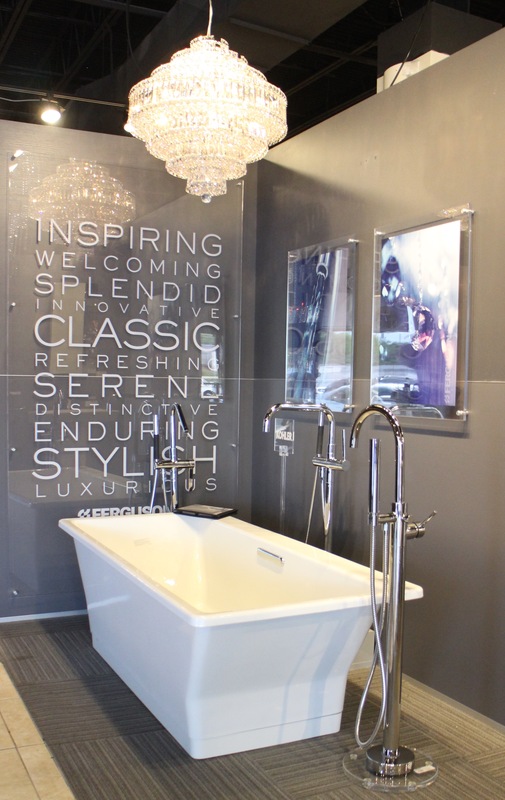 Home Depot’s high-end kitchen and bath showrooms? How about the Great Indoors? What ever happened to those? After a recent google search, I discovered that in 2009, Home Depot closed 34 of their Expo stores, including the one in the Houston area. And the Great Indoors that I remember visiting as a child is also a thing of the past. I did not let this deter me from finding the experience that I was looking for. After some research, I found a few showrooms in the area. None as epic or grand as the Expo, but my needs were minimal. All I wanted was to sit in an oversized bathtub that was in a row of other oversized bathtubs, or at least have the option to. So I found a few candidates and ended up choosing Ferguson. All the online browsing and Pinteresting in the world is not the same as seeing and feeling something in person. Upon entering the showroom I was ecstatic that this place was not letting me down. There were plenty of bathtubs, sinks, plumbing fixtures, and enough rain showerheads to last a lifetime. I was in heaven. They even had the Numi – the super smart and fancy Japanese style toilet by Kohler ( I would recommend watching this video. How do they make a toilet seem so elegant?). The other side of seeing things for yourself is that you might discover that some things that you wanted just won’t work. For example, I had to see it to believe that my master bathroom floorplan was not conducive to a free standing bathtub. My husband already knew this and already warned me, but I wouldn’t accept it until I visited the showroom. Sad but true. But again, this was a necessary step in my home-building process. The highlight of my visit was the sighting of the Jenn-Air Obsidian in the wild (pictured here). Isn’t it BEAUTIFUL. After seeing it in a magazine from 2013, I thought it was only a thing of legend. But I finally got to see it in person and it was every bit as exquisite as I thought it would be. If you haven’t heard of Obsidian, it is the first fridge that has a black interior. 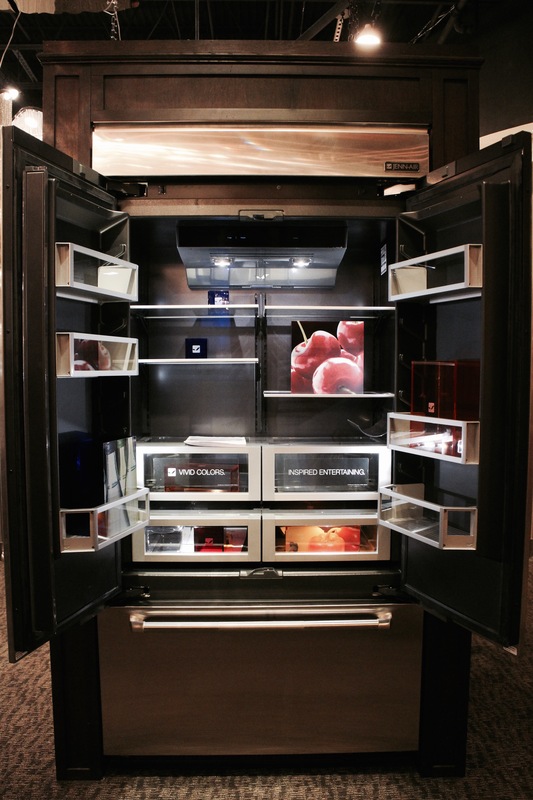 With a dual evaporator system, this ten thousand dollar fridge is both functional and gorgeous. 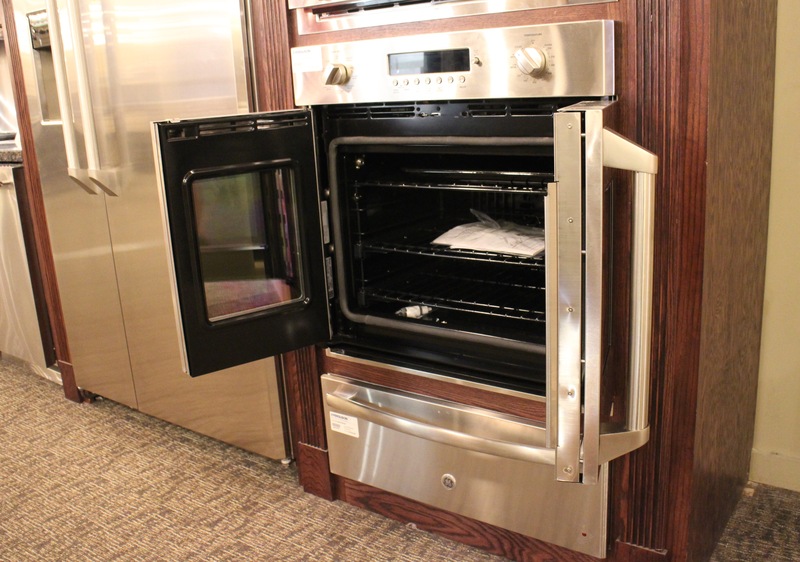 Perhaps secondary to the Obsidian was the GE Profile Series 30 in French Door Oven. In the flesh. Inspired by restaurant ovens, these doors are connected and swing open and closed together, making it easy to maneuver with one hand and also making food easily reachable with hopefully fewer forearm burns. Setting you back about $4000, this dream is slightly more attainable. I’m also in the search for pendant lights, and though I did not find any that my husband and I could agree on, my trip was definitely worth it. Next showroom I am going to try is Morrison, stay tuned!